A Chamber Jazz Recital was held in Minsky Hall on Oct. 18. Photo by Jack Barber, Contributor. On Wednesday, Oct. 18, students performed at the University of Maine Chamber Jazz Recital hosted in Minsky Recital Hall. This year marks many big anniversaries in jazz history. While the music genre’s exact origins are still widely disputed today, this first jazz recording as well as the birth of many jazz greats are attributed to 1917. Directed by Dan Barrett, Mark Tipton and David Wells, the four featured ensembles performed 14 songs. The students were joined by special guest Michael Bennett, who graduated from the University of Maine with a bachelor’s degree in music education in 1993. Bennett has taught percussion for more than 35 years, and has gained recognition as one of the chief experts in the nation on Gambian percussion music. In an interview with the Bangor Daily News, Bennett discussed his origins in folk and jazz drumming and how he became such a dedicated percussionist. When trying to discover the musician who originated the groove of jazz, historians have not been able to attribute it to any specific person. According to the BBC, in February 1917, Livery Stable Blues by the Original Dixieland Jazz Band was the first jazz recording. While the Original Dixieland Jazz Band cannot be celebrated for originating the sound which they produced, many influential jazz icons such as Dizzy Gillespie, Ella Fitzgerald, Mongo Santamaria and Thelonious Monk celebrate their 100th birthdays this year. These artists’ work and contributions to the genre have helped mold how we define and understand jazz; however, even they did not construct the sound. All of these musicians, as well as jazz musicians today, were inspired by artists such as Duke Ellington and Louis Armstrong, who are credited with popularizing the genre. When people hear the name Duke Ellington, it normally invokes images of a smiling man sitting behind a piano and the melody of one of his most popular songs, “It Don’t Mean A Thing.” On Wednesday evening, this song was performed at the UMaine Chamber Jazz Recital along with many other jazz hits. Sam Nichols, a third-year student studying secondary education with a biology concentration, played “It Don’t Mean A Thing” with the evening’s second ensemble. Nichols began to learn trombone in the fifth grade. He has played in jazz bands, concert bands and wind ensembles, and practiced music as much as he could. 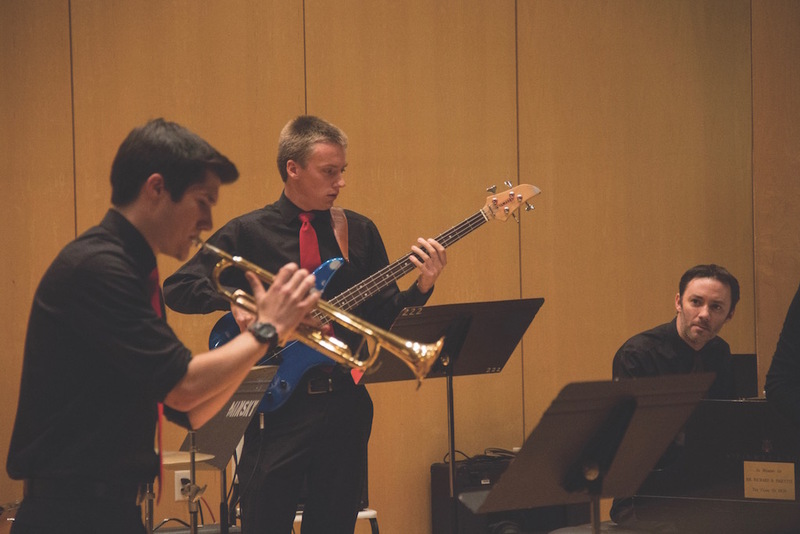 Michael Bennett, Nichols and other students who performed in UMaine’s Chamber Jazz Recital are helping preserve the American jazz culture by continuing to share the relevance and importance of jazz, 100 years after its first recording.